It’s going to get cold, and wet. You don’t need us to tell you that. Yet despite being warned about dwindling daylight hours and frigid days ahead, it’s easy to let form slip in favour of function when the mercury drops. Wise to the fact, Glasgow-born brand Ted Baker is taking a stand against seasonal dressing disorders with its ‘Winter Warmers’, an edit of the toastiest pieces amongst its AW15 sartorial offering. Designed to protect you from winter’s worst, look no further than this curated range for the answers to all your seasonal quandaries. As autumn hardens into winter, nature’s bright hues give way to duller, lifeless tones. But that’s no excuse for outfitting your wardrobe in a similarly drab fashion. 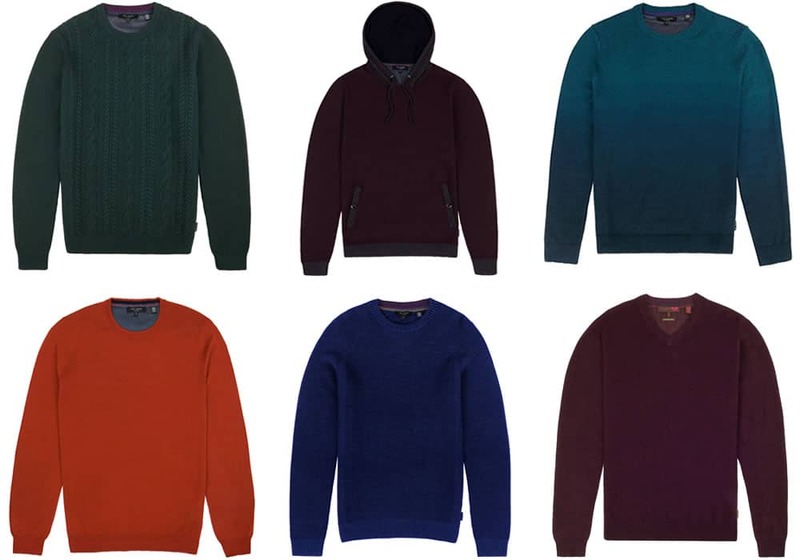 Instead, swap icy, SAD-inducing neutrals for the vibrant palette of Ted Baker’s luxurious knits. Shades of burgundy, teal and bottle green appear on everything from knitted hoodies and funnel necks to classic crew and V-neck jumpers in the brand’s AW15 collection. And because materials matter, the use of cashmere and merino wool – fabrics known for being warm, durable and water-repellent – make for outfits that pack a colourful punch but can still take a battering from the elements. Look to the ombré effect Holaday crew neck and zigzag pattern Carguy jumpers to instantly inject a point of difference into your cold-weather looks. Building a winterproof wardrobe that looks as good as it performs is no mean feat. And over-layering in order to stay warm is where many come a cropper of cold-weather dressing (often resulting in a look that’s more John Goodman than David Gandy). To avoid overburdening yourself, make Ted Baker’s sophisticated on- and off-duty coats your armour against the elements. Dreary morning commute to dress for? Liven things up with the Donovan showerproof mac and its head-turning contrast printed Harrington collar. Christmas market-bound? Cover up from the chill with the deluxe Taranto coat, complete with a detachable shearling collar. Or maybe you’re searching for something to beat the cold when strolling to-and-from the pub? The Bartley wool pocket coat equipped with a removable faux fur collar trim fits the bill perfectly. Contrary to what your mum might’ve told you, you don’t lose most of your body heat through your head. Nevertheless, you do lose some, and windswept is never a good look. Anyway, whether or not it’s actually sub-zero where you are, good headwear, styled with the right look, is always something to tip your hat to. Ted Baker does a great job of producing styles that sit as seamlessly with your outfit as any other accessory. So much so that you won’t want to take your hat off once inside (but make sure you do). Styles that cover your ears are usually less formal than those that don’t. So depending on whether you plan on wearing it for business or pleasure, or something in between, we recommend the Mittoo moulded wool trilby hat, Morhem twisted yarn beanie or Pattoo printed baseball hat. Face snow, sleet, and anything else winter hurls at you with confidence by investing in a quality scarf. As well as keeping your neck from freezing over, a scarf also makes for an easy way to introduce colour to an outfit that’s otherwise humdrum. As with knitwear, you can’t go far wrong with cashmere, which is why Ted Baker has chosen the material for its Pinnick herringbone scarf, a luxurious swathe of the stuff that’s finished with fringed edges and a subtly branded metallic bar embellishment. Try this over your suit and under your overcoat for a no-fail frost-blocker. Or, wrap up for a festive party with a lightweight scarf like Ted Baker’s Britney in silk paisley and you’re the walking definition of dapper. Unless you’re still taking style tips from your 14-year-old Goth self, there’s nothing fashionable about ashen, cold and dry hands. So look to defend your digits with a pair of stylish gloves that you won’t be able to keep your hands off for seasons to come. Ted Baker’s Korr textured gloves in chocolate, green and oxblood are made from ovine leather, which is finer than other leathers and delivers a wider range of movement. But it’s the Demquil pair you’ll want to turn to when the mercury really drops. Its combination of a quilted fabric back and leather front pairs the rough with the smooth, while its knitted cuffs create the perfect barrier for any cold fronts. And you can still use your smartphone when you’ve got them on, meaning you needn’t really take them off ’til March. Despite bringing up the rear of this line-up, a pair of sturdy boots should be at the top of any winter shopping list in preparation for navigating the slush-covered streets. Where Ted Baker stands tall is in its ability to turn out pairs far more practical than a dress shoe but sleek enough to team with suit trousers. To take on the toughest of terrains, rubber up with the Daeon lace-ups for a suited-and-booted approach that’s on-point. Or look to the Sealls2 wingtip brogue boots, which team the refined aesthetic of a dress shoe with the solid foundations needed to get you to work on time (and upright). And when Mother Nature starts to soften a little, slip on a pair of the Brutass suede Chelsea boots – just don’t forget to protect them with a spray, in case it’s only a short-lived respite. Unless you’re planning to go into full-blown hibernation this winter, now’s the time to start planning how to look cool rather than cold this season. Luckily Ted Baker is on hand with its edit of these tried-and-tested essentials that will serve as the cold-busting backbone of any wardrobe for the months to come. Shop the full Ted Baker Winter Warmers edit online now.